The Battle of Bunker Hill was one of the early battles of the Revolutionary War and the most significant battle of the Siege of Boston. The Siege of Boston began after the Shot Heard Round the World took place in April of 1775 and the British retreated back to Boston where they were trapped inside the city by the rebels. What Was the Battle of Bunker Hill? The Battle of Bunker Hill was a military conflict between the American colonists and the British government during the Revolutionary War. What Year Was the Battle of Bunker Hill? 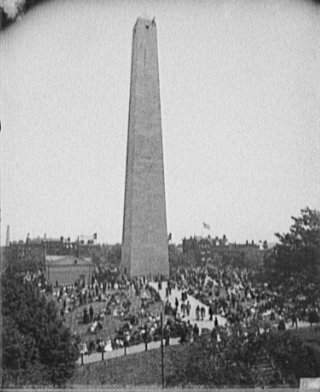 The Battle of Bunker Hill took place on June 17 in 1775. 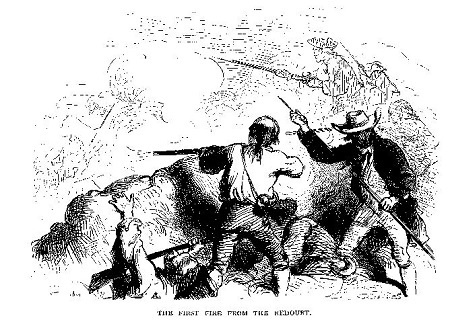 The battle was fought on Breed’s Hill in Charlestown, Massachusetts. What Caused the Battle of Bunker Hill? The British troops had been blockaded inside Boston by the American troops since the Siege of Boston began on April 19, 1775. 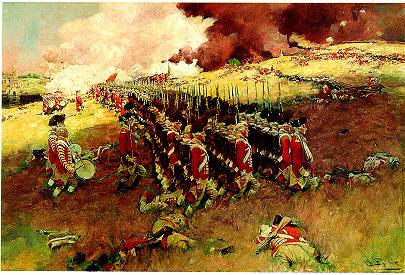 The British army felt that if it could take control of the hills surrounding Boston, they could break the blockade and have complete control of Boston. The colonists found out about the plan accidentally when an unidentified New Hampshire resident happened to learn of it in a conversation with a British officer and later reported it when he returned home to New Hampshire. The issue was raised on June 13 at the Committee of Safety meeting in Exeter, New Hampshire, and word was quickly sent to the American troops in Boston. To prevent the British troops from carrying out the plan, Colonel William Prescott and his men marched to nearby Breed’s Hill, although they were originally ordered to go to Bunker Hill, on the night of June 16 and hastily built a large earthen fortification. 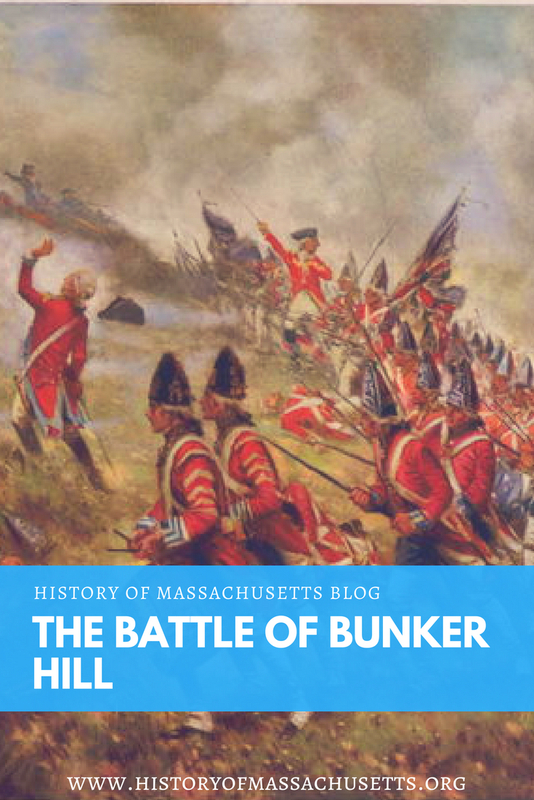 Despite the fact that the battle took place on Breed’s Hill, it still came to be known as the Battle of Bunker Hill. Colonel Prescott troops consisted of somewhere between 1,200-1,500 men, including General Joseph Warren, General Israel Putnam and General Henry Burbeck, who had helped make ammunition for the battle alongside his father Lieutenant-Colonel William Burbeck. When the British military saw the fortification on the hill in the early morning light, one of their ships anchored in Boston harbor, the “Lively,” opened fire on it but did not cause much damage. The ship was ordered to cease fire but Prescott’s troops quickly came under fire again from a battery of guns and howitzers on Copp’s hill, to little avail. At about 3 p.m., over 2,000 British infantry soldiers arrived in Charlestown village and found themselves under sniper fire from the village. In an attempt to clear out the snipers, British troops set fire to the town and burned it to the ground. 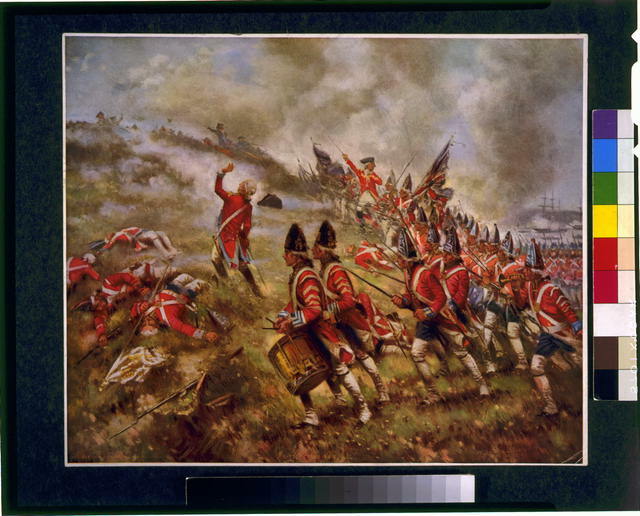 British General William Howe ordered the troops to meet at the base of the Breed’s hill, clad in their bright red coats and carrying heavy equipment and bayonets, and charge towards the colonists through the open fields on the hillside. When the soldiers were within 150 feet of the redoubt, the colonists opened fire. The British took heavy losses from this first round of fire and retreated back down the hill. After regrouping, the British made a second charge up the hill but were again thwarted by heavy fire and retreat. After waiting an hour, the British received 400 more soldiers from Boston and made a third, and final, attempt at taking the hill, just as the colonists ran out of ammunition. The battle was then reduced to close combat, during which many soldiers fought with nothing more than rocks and the butts of their guns, and the British finally took control of the hill. Defeated and defenseless, the colonists retreated back up the Charlestown peninsula to Cambridge. The colonists suffered most of their casualties, including the death of patriot leader Joseph Warren, not during the battle but during the retreat. The exact whereabouts of Warren after the battle was unknown but when he failed to reappear after the retreat, the colonists assumed he was killed in action. 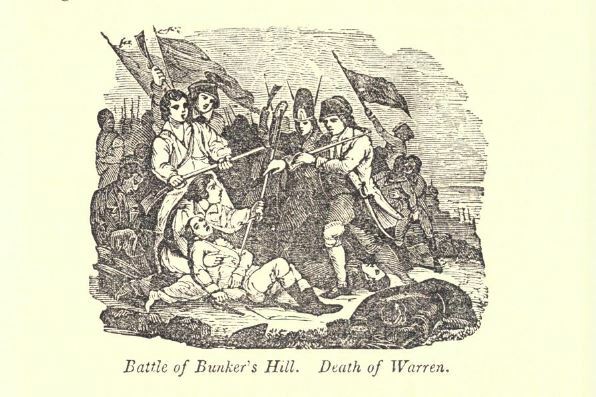 Warren had in fact died from a shot through the head and British soldiers buried him on the hill in a shallow grave with another colonist. 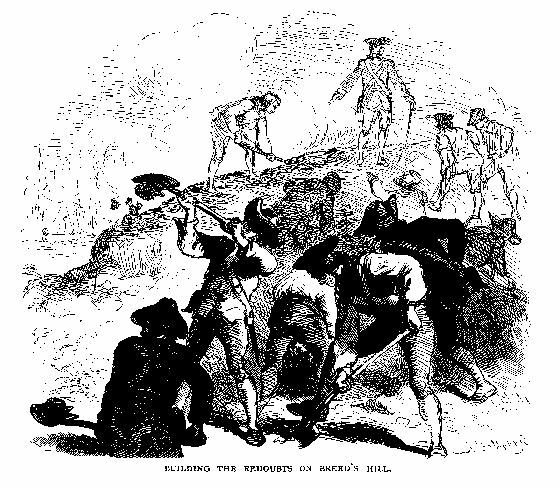 After the British left Boston in March of 1776, Warren’s body was dug up and identified by Paul Revere who recognized Warren’s two false teeth, which he had installed with a metal wire earlier in the year. 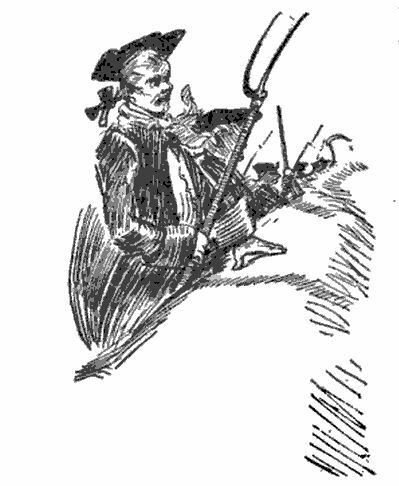 The last colonist to die during the battle was Major Andrew McClary, who was hit by cannon fire from a frigate in the harbor while retreating through Charlestown neck, the narrow land bridge connecting the peninsula to the mainland. McClary was thrown a few feet in the air by the cannon fire before landing dead, face down on the ground. Fort McClary in Kittery, Maine was later named after him. By the end of the three-hour battle, 268 British soldiers, including a large number of officers, and 115 American soldiers, lay dead and several hundred more were wounded. About 30 American soldiers, most of whom were mortally wounded and couldn’t physically escape, were captured. Yet another casualty of the battle was General Thomas Gage‘s military career. Gage was the commander of the British troops in Boston at the time and had ordered the assault on Breed’s Hill. Who Won the Battle of Bunker Hill? Although the British won the Battle of Bunker Hill, it was only a technical victory. Their heavy losses during the battle bolstered the colonist’s confidence and actually encouraged them to continue fighting the war. The British were still trapped inside the city but were eventually forced to leave Boston the following year in March of 1776 after the Battle of Dorchester Heights. Address: 43 Monument Square, Charlestown, Mass. Address: Monument Square, Charlestown, Mass. My Greatx5 Grandfather, Capt. [Lt} at that time] Benjamin Brown and two of his brothers, participated in that battle. One brother was wounded while retreating and later both brothers gave their lives for out independence. Looking for an ancestor who was supposedly KIA at the Battle of Bunker Hill, looking for a William Loomis or Lummyus. William loomis fought in the battle of bunker hill and she was fighting along with George Washington. If you would like to see more. Go to history.com/williamloomis. Looking for any information on anyone surname of “Puffer” who fought at Bunker Hill (1775). Puffer’s originally settled in Braintree, MA. , apparently……a George Puffer was the original settler, died in Braintree in 1639. After George, there was Matthias Puffer (1635-1717), followed by Eleazer Puffer (1684-1747), followed by Lazarus Puffer (1729-1778), followed by Simeon Puffer (1759-1825), then Cornelius Puffer, who ended up re-settling in Canada (1793-1860), then John Puffer, also settling in Canada (1830-1881) and then there is a succession of Puffer’s that made Northumberland County (Ontario), Canada their home. There are still quite a Puffer’s in Braintree, MA . Looking for a surname Gunther who was KIA at Bunker Hill. He hailed from Lancaster PA. He is in our family tree and looking for information.